MINNEAPOLIS/ST. 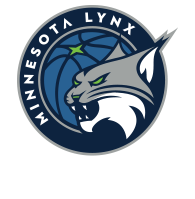 PAUL – Minnesota Lynx Radio Play-by-Play Announcer John Focke has been named Minnesota State Sportscaster of the Year by the National Sports Media Association (NSMA). 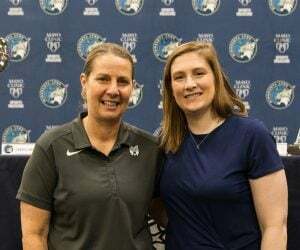 The award is Focke’s first in his three-year career as the radio voice of the Lynx and the second for a broadcaster in the Timberwolves and Lynx organization (Kevin Harlan won the award in 1996). Focke was nominated along with Dan Barreiro (KFAN) and Cory Provus (Go 96.3 Twins Radio Network). Finalists were nominated by NSMA members in each state who nominated up to three people for each category The NSMA consists of over 800 leading sportscasters and sportswriters throughout the country. Focke will be honored as part of the 59th annual NSMA Awards Weekend, June 23-25, 2018, in Winston-Salem, NC. 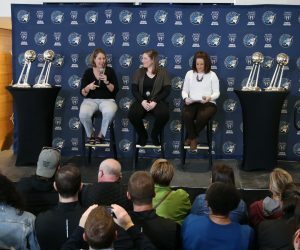 John Focke wrapped up his third season as the full-time Play-by-Play Announcer for all Minnesota Lynx games following the 2017 Lynx title run. Focke joined the Lynx Radio Network as Producer and Studio Host before the start of the 2008 season. 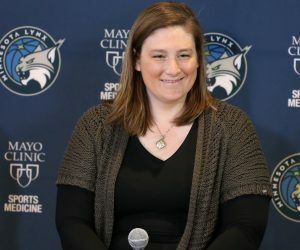 Beginning in 2012, Focke acted as Play-by-Play Announcer for Lynx road games before moving into the full-time position beginning with the 2015 season. 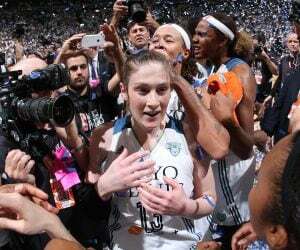 He is also the Executive Producer and Studio Host for all Timberwolves games. Prior to joining the Timberwolves and Lynx, Focke was the voice of Northern Michigan University Hockey as well as the host of the University’s football and basketball pregame, half-time and post-game shows, in addition to providing color commentary for the games. A native of St. Paul, Focke graduated from Ohio University in 2002 before starting his career as a sports director at KATE Radio in Albert Lea, MN where he called play by play for the local high school and covered the Wolves, Twins, Vikings, Wild and Gophers. He also spent a year with the Minnesota Wild as a part time producer with the Wild Radio Network. Focke and his wife, Ali, live in Minneapolis. Sportscaster of the Year and Sportswriter of the Year from each state, as well as a National Sportscaster and Sportswriter of the Year. A Hall of Fame induction ceremony takes place at this time as well.